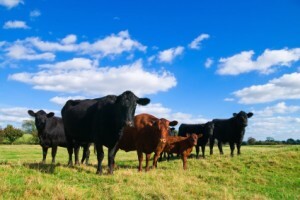 Having trouble finding grass fed meat in Los Angeles and California? Unfortunately, the ongoing drought in California is taking a toll on grass fed beef ranchers. There simply isn’t enough grass to feed the cattle and ranchers are being forced to resort to grain feeding to sustain their herds (Los Angeles Times “Another Drought Victim – Grass Fed Beef). This is unfortunate but necessary. However, as many of you may already know, the meat from grain fed beef cattle has an entirely different nutritional profile as well as taste and texture from that of organic grass fed meat. Once you have learned the differences and come to enjoy grass fed meat, it is hard to think of going back to the old ways of grain fed beef. You can still find 100% grass fed meat in Los Angeles and Southern California! Although California is experiencing the worst drought in memory, cattle raised in the Pacific Northwest, like Topline Foods’ beef, still enjoy a natural diet of 100% organic grasses on pasture. The climate in this region of the United States still provides ample grasses for roaming and foraging. Our beef enjoy organic pastures their entire lives and never receive any antibiotics, added hormones, steroids or other growth promotants. How do you buy organic grass fed meat in Los Angeles and Southern California? Just shop online with Topline Foods, we’ll process your order and email you promptly to let you know when to expect your grass fed meat. Usually, shipping occurs within a couple days of your order. Southern California, including Los Angeles, Orange County and San Diego is an overnight delivery via UPS so you get the best price for shipping. This entry was written by Jeff, posted on March 20, 2014 at 10:33 pm, filed under Blog, News and tagged beef, buy organic grass fed meat beef online Los Angeles California, CA, California, grass fed, grassfed, Los Angeles, meat, organic, So Cal, where to find organic grass fed meat beef in Southern California. Bookmark the permalink. Follow any comments here with the RSS feed for this post. Both comments and trackbacks are currently closed.